Winter term due by Dec 16th, 2018. Late fee of $25 if received after Dec 31st, 2018. Spring term due by March 15th, 2019. Late fee of $25 if received after April 1st. Please speak to me if you need special payment arrangements. 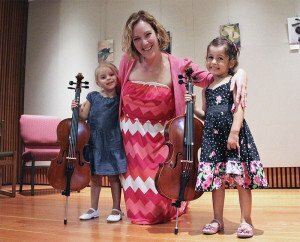 After two and a half years of cello instruction under Valdine’s guidance, and with persistent practice, my children were able to enroll in a local children’s chamber orchestra at an entry level. Valdine visited my children at the orchestra when we first enrolled to ensure that her students were doing well. Not only does Valdine teach my children music, she has inspired me to be a patient parent, to enjoy every little present precious moment with my children while understanding the true meaning of perseverance. Valdine knows more than other teachers I have witnessed about the technique of playing the cello, especially but not only smart fingerings and mastery of the bow. So she is able to produce good results in students quickly. Valdine is extremely humble. For example, in the last lesson, she started demonstrating a passage and made a mistake, explaining at once that she had just missed a day of practice and it was showing. That was a good illustration in itself to Lucien about the need for even experienced professionals to keep practicing every day. Ms. Valdine has completely changed my playing for the better! Valdine is an excellent teacher with highly professional performance skills, a comprehensive knowledge of music and with high credentials in both cello and piano. She has a wonderful personality and has the rare ability to inspire her students. As a parent, I admire her for her unlimited patience with her students, even more so for little students with different temperaments and attention spans – an age range from as young as 4 years old to college age. Valdine is easy to communicate with, in person, by text, on the phone, and by email. She always responds quickly and helpfully to questions and concerns. Valdine often demonstrates passages herself, or plays along with students, in an inspiring and uplifting way. Valdine is flexible about the needs and pace of individual students. For example, when Lucien has needed to prepare for an orchestra audition or a private performance, she has happily switched to concentrating on that repertoire for the time being, before resuming the systematic study of Suzuki books and etudes. plus 4 flex-scheduled summer lessons.